The other day I was bumming around on IRC, decidedly not doing any sort of writing at all, when I happened across a conversation between several Internet folk about nothing other than writing software! One of these fine IRC-persons mentioned that they found a program called WikidPad most useful in keeping their thoughts straight. WikidPad, in a similar fashion as my note-keeping program of choice, Zim Wiki, acts as a personal wiki for your thoughts. It has an advantage over actual server-side wiki software, such as MediaWiki, in that it is easy to set up and everything is kept locally on your computer. However, the main advantage of using a wiki – being able to create separate pages and link them together at will – is preserved. Doubtful I would find a program to replace my beloved Zim, I decided to give it a whirl anyway. Unfortunately WikidPad isn’t the most straightforward of installs, which is why I’ve chosen to spend this post talking about the actual steps I took to get the program up and running. For Windows users, WikidPad comes with a single binary installer that takes care of anything for you. But if you’ve so much as read the title of this fine blog, you know we’re not dealing with something so simple as that. No, we Linux users get treated to a lovely little zip file of python code! 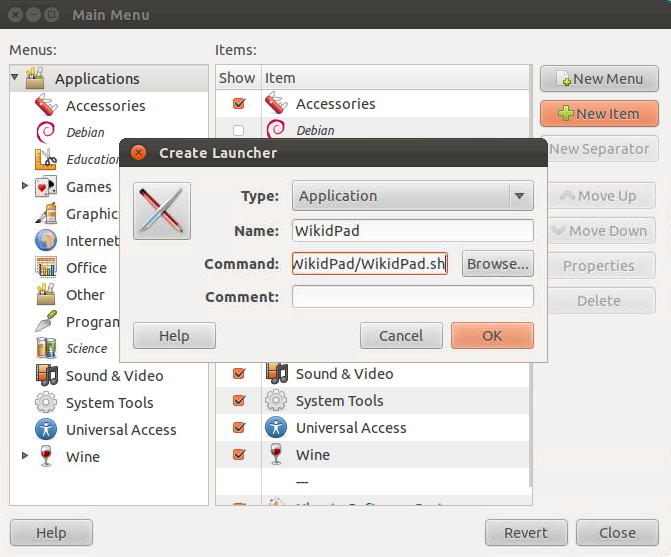 If, for whatever reason, you don’t have it, you can also find it in the Ubuntu Software Center. Open it up, click “New Item,” and write the full path to your bash script under “Command”. Press “OK,” and WikidPad will be available in the dashboard. And now, having gotten this far, I might just see what the program’s actually like. Who knows! works well in Ubuntu 11.10.
using Ubuntu 11.10, the getdeg thing Mir mentioned didn’t seem to work for me. wikidpad automagically appeared under Accessories in the launch menu (i’m using Cairo-dock, forget what the launch thingy is called in vanilla 11.10). now, on my wiki way. If you’re using linux I would strongly recomend using one of the newer (beta) versions 2.3+ as it has some major improvements (namely webkit intergration if you install the necessary dependencies, “pygtk” and “pywebkitgtk”). It’s actually very difficult in this full of activity life to listen news on TV, therefore I simply use the web for that reason, and obtain the newest news. yet effective. A lot of times it’s tough to get that “perfect balance” between user friendliness and visual appeal. I must say you’ve done a awesome job with this. What’s up, yeah this paragraph is truly nice and I have learned lot of things from it regarding blogging. thanks. I’ve learn some good stuff here. Certainly value bookmarking for revisiting. I wonder how a lot effort you set to create this sort of fantastic informative website. What i don’t understood is actually how you are no longer actually much more neatly-preferred than you may be now. You’re so intelligent. aren’t fascinated except it is something to do with Girl gaga! Your individual stuffs nice. At all times deal with it up! and i could assume you’re an expert on this subject. Fine with your permission allow me to grab your feed to keep up to date with forthcoming post. Thanks a million and please carry on the rewarding work. work on. You’ve done a formidable job and our entire group will be thankful to you. I have loaded your blog in Several completely different browsers and I must say this website loads a lot quicker then most. Would you mind e-mailing me the name of your website hosting company? Your article has proven helpful to me. It’s extremely educational and you’re clearly very educated in this field. You have opened my eyes to varying views on this topic with interesting as well as solid content. It’s like you read my thoughts! You seem to realize a lot regarding this, just like you wrote the e-book in it or something. This is a great blog. I’ll certainly be back. for more superb content articles. It’s all too easy to read and comprehend and also intelligent post. As being a first timer, I’m discovering online for articles which can be of assistance to me. Yours is beneficial glad to have discovered it. Cheers. I’m completely new to running a blog however I do write in my journal everyday. I’d like to start a blog so I can easily share my experience and feelings online. Thanks for the info! Led me here and made install of 2.2 simple. Running Mint 17, but the Ubuntu 14 package works great.